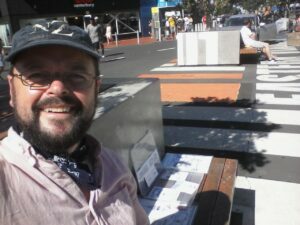 I hope you enjoy the first in what will be an occasional series of guest blogs from our Collectivists. David is one of the original members of the Collective and I have known him for several years. I am thrilled that he decided to join us and have enjoyed seeing the development of his technique over the time that I have known him. As his title suggests, he travels a great deal and we don’t see as much of him in Edinburgh as we would like but always look forward to his visits! Travelling around the planet, painting and gaining experiences of different cultures and creative endeavours gives me a sense of furthering my career in a self-directed, and self-taught manner. My travels to Australia have opened my view to a much larger canvas. Grace Cossington Smith is noted as one of the most important artists of the twentieth century. Smith is seen as being instrumental in helping to introduce the post-impressionist school of painting to her country. 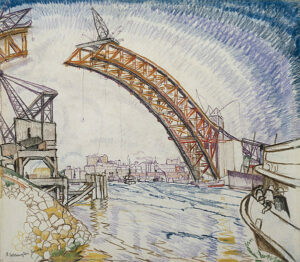 Some of her more well known pieces included depictions of the Sydney Harbour Bridge as it was being built. Smith gives a true sense of being a pioneer, both in her subjects and herself! The look on the soldier’s face is mesmerising. Is he fearful? Resolute? 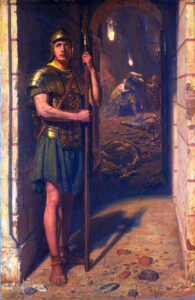 Is he standing guard, facing certain death, or about to flee? Is he about to help the people, such as those in the background, who are facing certain death? Although never faced with such dramatic choices myself, this painting by John Poynter often reminds me of my sense of values in the world. Be it as a scientist in Universities, administrator or graphic designer in the National Health Service, or as an artist in the world at large, the sense of being faithful to a cause, under whatever circumstance, resonates with me. A postcard of this painting follows me wherever I go. My first career was as a biologist, and blending the worlds of art and science is always a fascination to me. 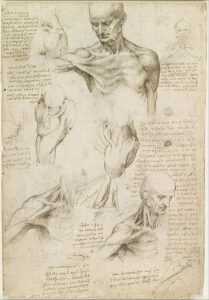 To view drawings by this master artist and genius is always a source of awe and inspiration. The example of such an identifiable drawing style, whilst learning about the scientific and natural world is a touchstone of masterful skill and human development. 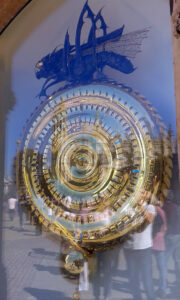 I saw this enchanting piece of sculptural engineering twice, once in Edinburgh and once in its home city of Cambridge. Created by 200 engineers, sculptors, scientists, jewellers, and calligraphers, the design engineer was Stewart Huxley, the chronophage was sculpted by Matthew Sanderson, and the graticule was designed by Alan Meeks. I see this as a wonderful example of human endeavour and invention. 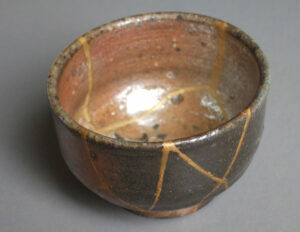 Perhaps my favourite form of craft and, indeed, art can be seen in what are often humble and simple objects. Which artist would I take with me on the island? Vincent van Gogh – to learn from a self-taught man, who studied and mastered his peers’ techniques, before developing his own unique style and pursuing his artistic career without notable commercial success (he sold only one painting in his life – to his brother)! What lessons could be learned by speaking to him! Yes, coffee with Vincent…as long as I had coffee on the island! Yes David, coffee will be on tap! What art equipment would I take? A full set of oil paints…of all media, this is the one where I hesitate the most, and being stuck on a desert island may give me the time, and seclusion I need to master it, and to develop my own style! Hello from the Caspian Sea!